MiG-29KUB fighters have outstanding handling qualities and highly reliable units, systems and components. Among the mainstays of the Russian and the Indian naval aircraft carrier fleets is the MiG-29KUB fighter aircraft, which made its maiden flight exactly nine years ago. The MiG-29KUB fighter aircraft made its maiden flight from the Gromov Flight Research Institute air base at 11:26 (Moscow time) on January 20, 2007. It was flown by test pilots Mikhail Belyayev and Pavel Vlasov. "The multirole MiG-29KUB fighter belongs to the 4++ generation. The airplane has an enhanced system of interaction between the pilot and the aircraft, with greater information support for the crew and better navigation equipment features, making it possible to approach to land using satellite systems", said Sergey Korotkov, MiG General Director, who personally piloted the aircraft following its successful testing. He pointed out the MiG-29KUB's high potential not only as part of the fleet air arm, but also for achieving superiority in the air and hitting surface targets with precision-guided weapons, day or night, in any weather conditions. 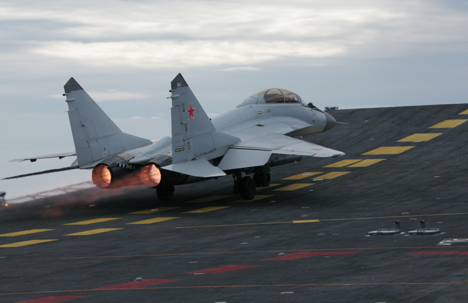 The MiG Corporation successfully met a defence order for 24 MiG-29K/KUB aircraft for the Russian Navy in 2015. Under this contract, signed in 2012, the Defence Ministry has received four MiG-29KUBs. Today, the corporation also makes MiG-29K/KUB aircraft for the Indian Navy, under a contract signed in 2010. "It's a superb plane. From the very beginning, the MiG-29KUB had excellent maneuverability, safety, automation, and simple and intuitive controls for the pilot. It permits effective use of practically the entire range of weapons available, including air-to-air and air-to-surface missiles, as well as future examples of weaponry", said test pilot Mikhail Belyayev. He also noted that the MiG-29KUB had great potential for the future, and could be upgraded over as long as 10-20 years. MiG-29KUB fighters have outstanding handling qualities and highly reliable units, systems and components. They have more than twice the flying life of previous aircraft in their class, and the cost per flying hour is almost 60% less. MiG-29KUB. Source: TV Channel "Zvezda"
"It is a modern multirole plane with revolutionary fighting capabilities, with an increased payload and a longer list of weapons," said Pavel Vlasov, Honoured Russian Test Pilot, Hero of the Russian Federation, and General Director of the Gromov Flight Research Institute (and Head of the Flying Service at MiG until 2010). He noted at the same time that the MiG-29KUB featured a range of new solutions, such as Krueger flaps, a new flap design, a modern fly-by wire control system, and significantly improved piloting conditions. The main customers for MiG-29K/KUB aircraft today are the Russian Ministry of Defence, which has bought 24 carrier-based MiG-29K/KUB fighters for the Russian Navy, and India. The fighters have an improved airframe with a high composite material content, a folding wing with enhanced mechanization, and quadruple-redundant fly-by-wire flight controls. The MiG-29K/KUB has significantly reduced visibility in the radar spectrum, and increased combat load, and an aerial refueling system. Among its weapons are guided air-to-air and air-to-surface missiles, guided bombs, unguided missiles, aerial bombs and a 30-mm internal cannon. The aircraft can be equipped with new models of airborne weapons at the customer’s request. Based on materials from MiG Corporation website.